The completely crazy kitchen. 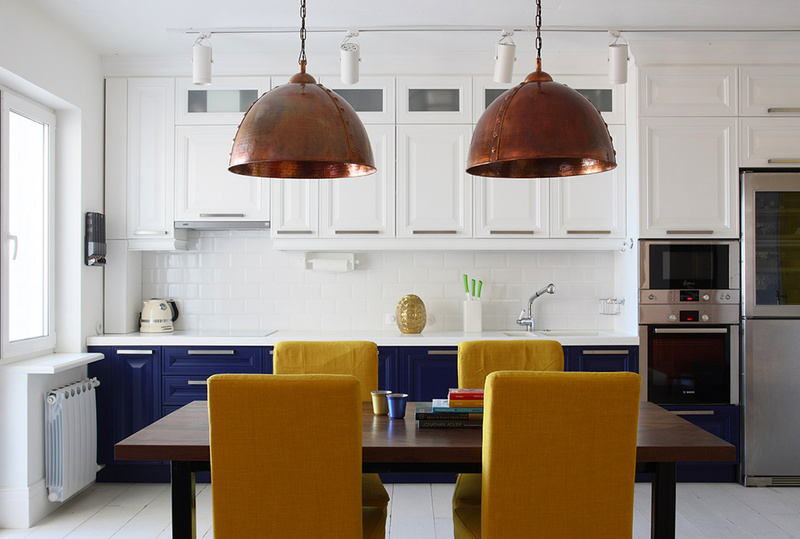 Industrial style remains perfectly here! 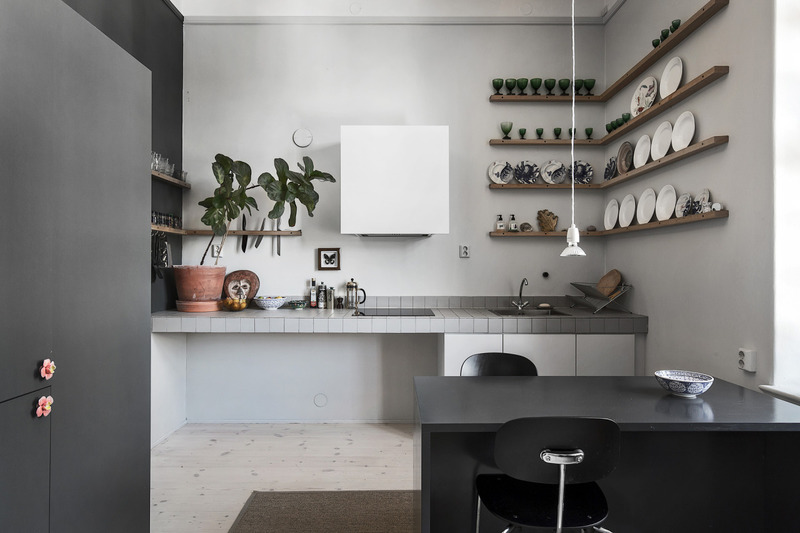 All kitchens are more or less the same now (I'm talking about the situation in Lithuania) – white, grey or wood imitation colors, cabinets are usually up to a ceiling so that the whole kitchen height would be used. 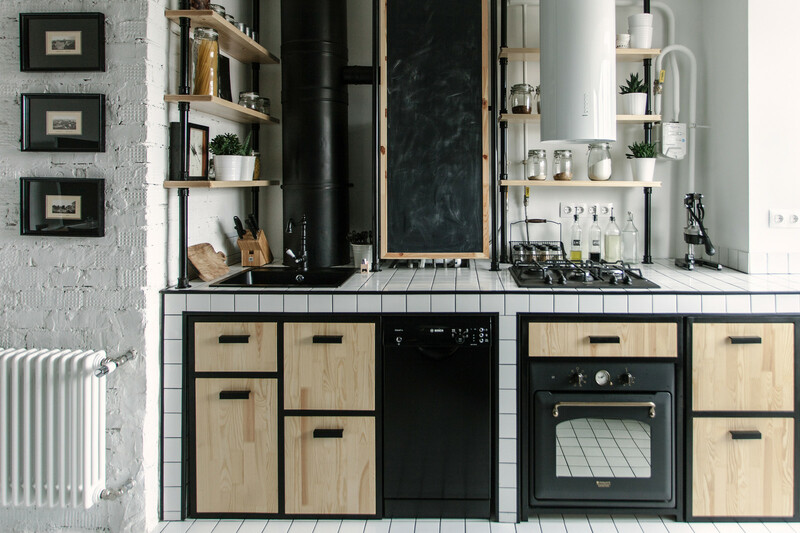 The solutions of a backsplash is usually more interesting, but a focus in a space is usually not something unpredictable – all spaces should have their focus. 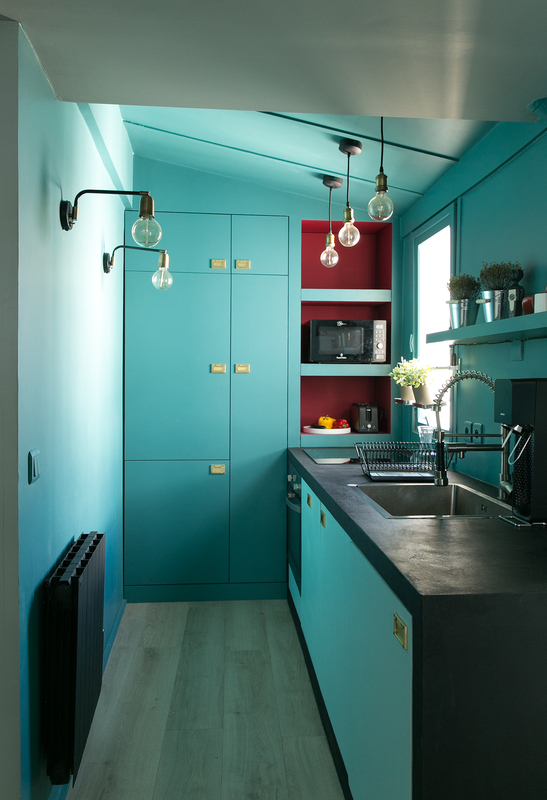 I‘ve collected the examples which illustrate non-standard kitchen interior – that can be color solutions, materials and textures or arrangement of furniture. Sometimes the space itself determines non-standard solutions, especially if a building is not new anymore and sometimes it‘s a conscious step and the way of expressing oneself. A complete non-standard. 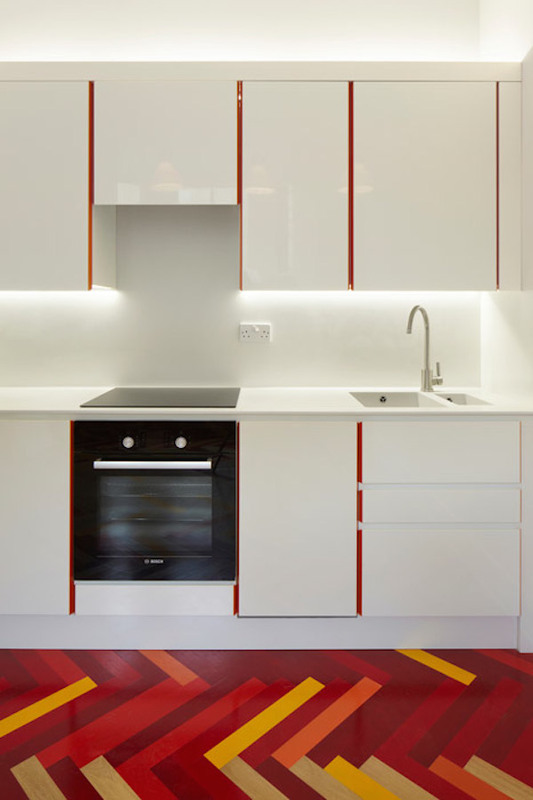 The space of a kitchen is below ground level of the main space, therefore, a worktop with two washbasins become and the shelf of bypassed space. It‘s interesting if such a solution doesn‘t impede the kitchen‘s care – I have such a sense that dust on such a worktop gathers a bit faster than usual. 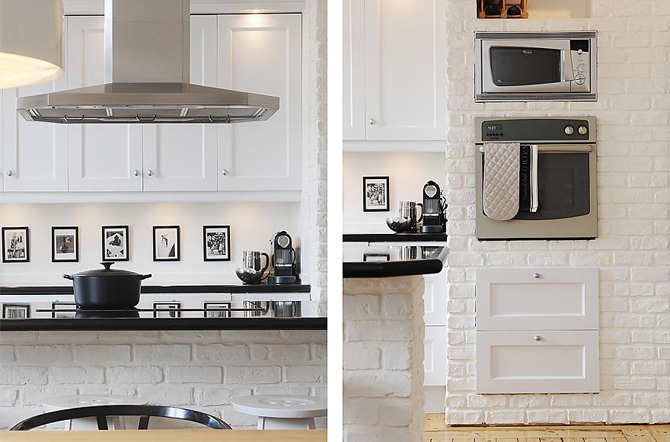 Beginning from color of cabinets and the finish of a wall and ending with the floor and absence of hanging cabinets – that‘s indeed an exclusive example of a kitchen who likes originality. A combination of the colors electric green and red and the handles look interesting. I like the choice of illuminators. 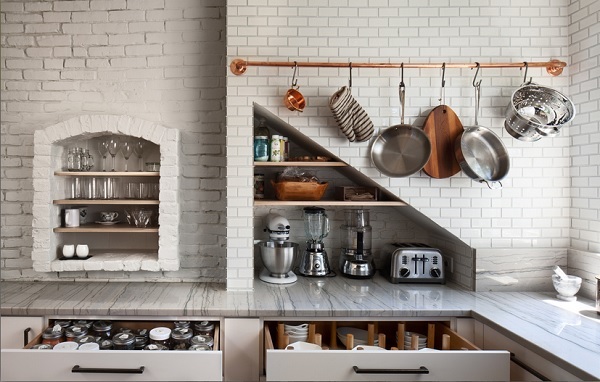 White bricks in a kitchen looks extremely cozy. The most non-standard solution is oven, micro-wave and two drawers embedded into that nice wall. A less non-standard solution is pictures in black frames under cabinets. 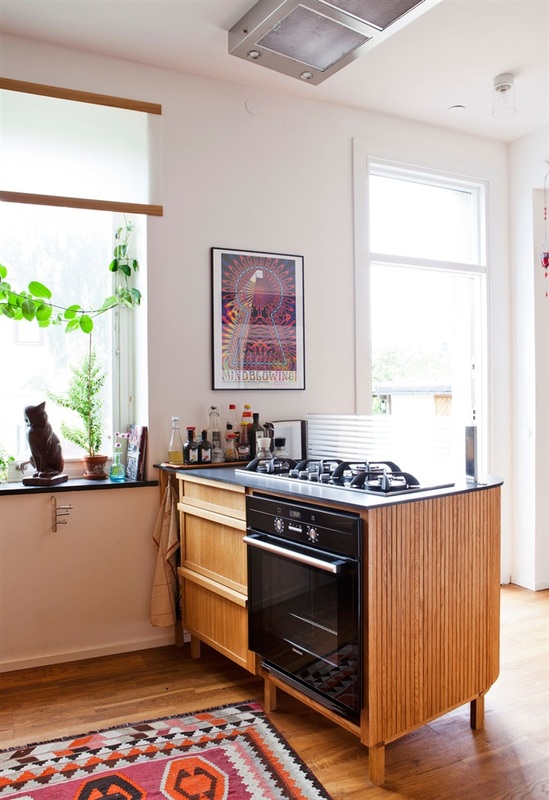 The whole flat is indeed exclusive (the link is on a photo, in a left side below)! A lot of work was made with this interior, thus it‘s difficult to believe that a flat is dedicated for a short-term rent. Step by step the trend comes to Lithuania to from foreign countries to offer something exclusive. I was admired by black furniture edges which make white furniture vivid, pink cable clutters and black ceiling on which you can even draw with chalk! I was bribed by the combination of very fresh white, dark blue and yellow in one space. In addition, a very unexpected illuminators choice! Endlessly funny composed niches which is the exclusiveness of this interior. Next two photos are out of the same kitchen. 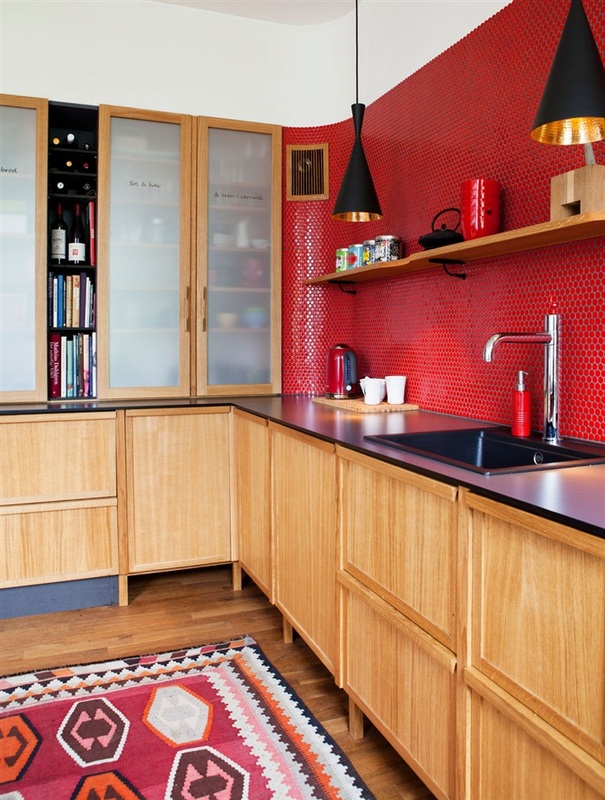 A bright wall of red mosaic tiles contrasts with black illuminators and light wood. Pay attention that the titles are written on the cabinets and an oven together with the zone that belongs to it, as if a queen, is established separately as if it was the kitchen‘s isle. That‘s the photo that has a very special aura. Well, it‘s indeed perfect. 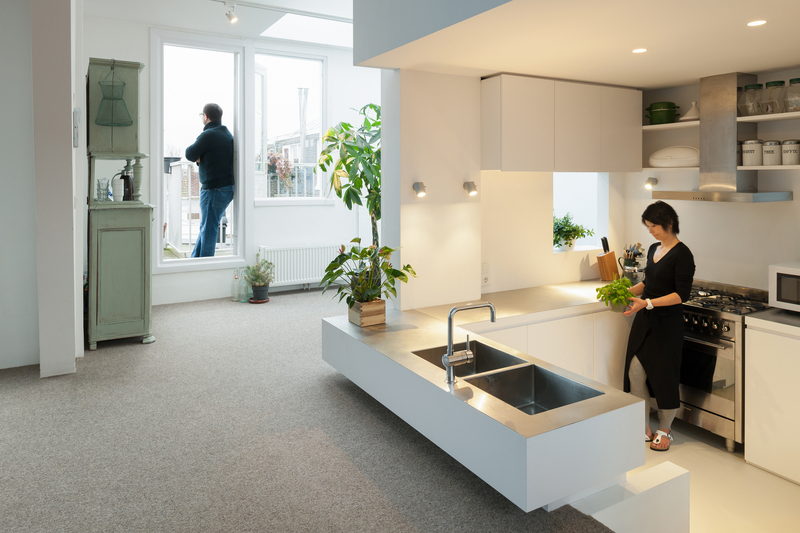 The choice of a worktop is indeed interesting here and the fact that there're no cabinets under it. Probably there will be chairs someday? The plates and glasses put on the shelves look like a picture. A hood is hidden under a white "box" and handles-flowers seen in the left lower angle raises smile. There‘s more dining space but still. 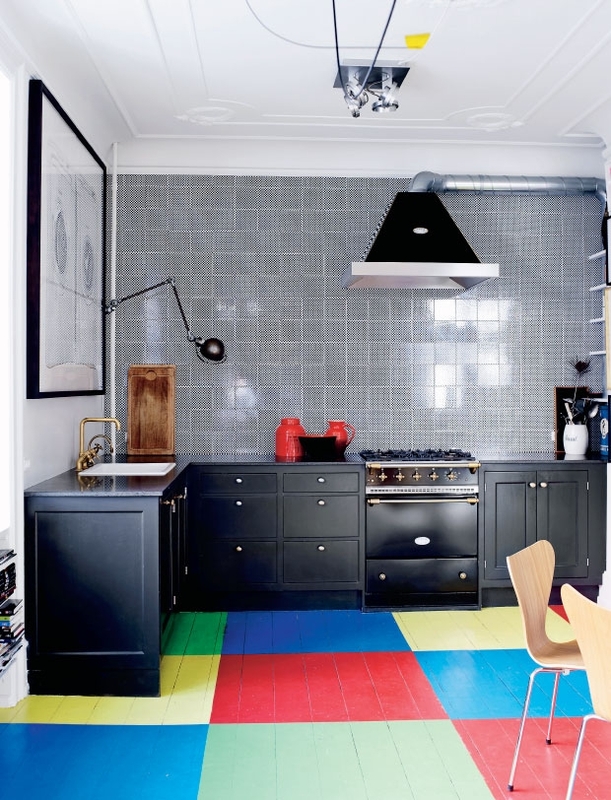 Our (Lithuania) flag became the focuses in this kitchen and such a combination in the interior is rather rare. I also liked the arrangement of cups. The completely crazy kitchen. Industrial style remains perfectly here. I somewhat imagine that very delicious dishes are made here. 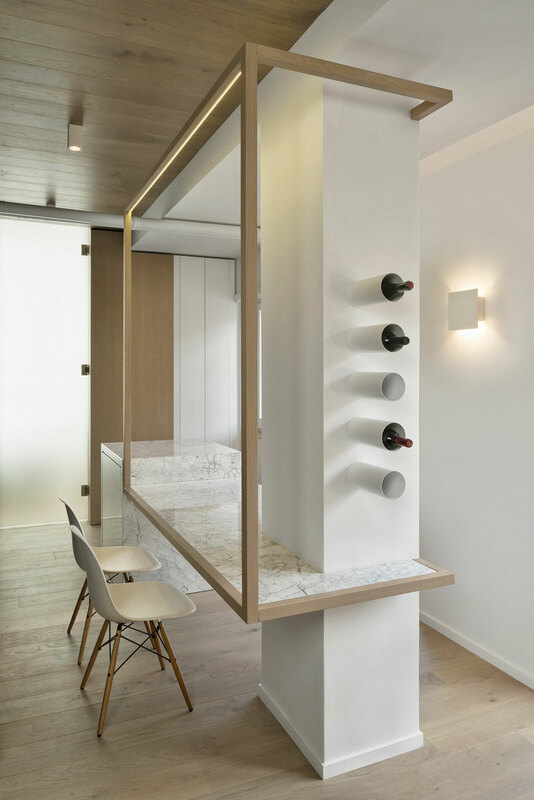 Well, that‘s not really a kitchen here but a very interesting solution of keeping wine and table design. 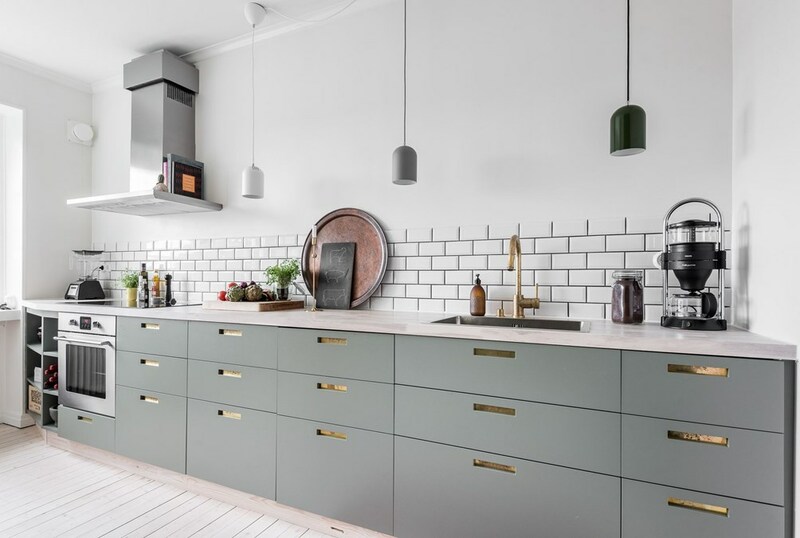 From the first sight that‘s a very standard Scandinavian style kitchen, however, I‘m admired by the impression of huge space (there‘re no hanging cabinets) and metallic handles which combine perfectly here and makes no impression of kitsch. 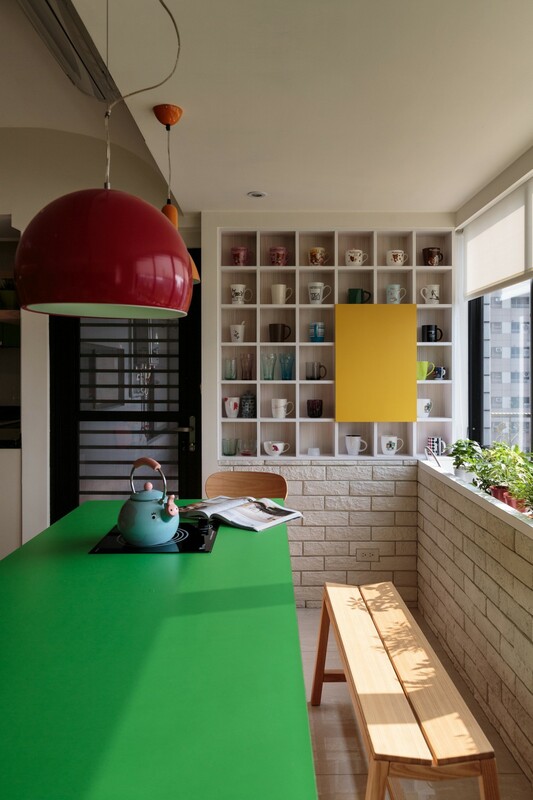 Some bright colors in non-standard places and the kitchen already looks different!